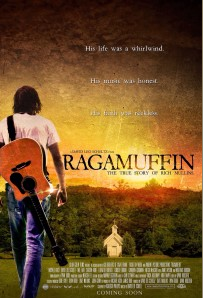 Los Angeles, Calif.(April 2, 2014) – The Ragamuffin film, based on the life and legacy of best-selling Christian music singer/songwriter Rich Mullins, is set to release on DVD May 6, 2014. The Color Green Films full-length feature will release first exclusively in Walmart retail stores through Millennium Entertainment followed by a nationwide CBA retail release on July 8 through Capitol Christian Distribution. Mullins, who died in a 1997 accident at the age of 41, grew up in Indiana, the son of a tree farmer father and Quaker mother. He performed with a touring Christian music group in his teens, and then attended Cincinnati Bible College from 1974 to 1978. Moving to Nashville in the 1980s, Mullins wrote songs for Amy Grant, Debby Boone and other notable Christian artists and recorded nine solo projects with Reunion Records. He was nominated for twelve Gospel Music Association Dove Awards throughout his career, and had many #1 radio hits. His church standard, “Awesome God,” was voted in 1989 as one of the top three songs of the decade according to the Christian Research Report. Color Green Films was founded in 2005. CG Films is a work in progress, as our audience grows for our films, we hope to as well. We hope to create art. Picasso once said that “taste is the enemy of creativeness.” Both life and tastes are ephemeral and ever changing. We hope to create films that can be a train station for all the passions, desires, dreams, and creativeness that we can think up. A tunnel through which we can laugh, cry, dream, and hopefully inspire.